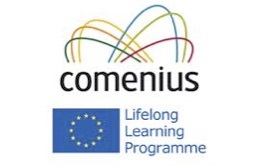 Over the past 2 years pupils from Shoscombe Primary School have been part of a European funded, International Comenius Partnership Project called The 100 Project. As part of the aims of this Comenius project pupils have produced research about the history of their local area and country, and revisited key events of the past 100 years. In particular they have looked at changes brought about by World War 1 and the subsequent developments in attitudes, employment, industry, transport (ie decline of local railways), science and technology. They have also collaborated with artists, musicians writers from the local community on work reflecting the project themes. Therefore we were thrilled to be invited to participate in the Goldies WW1 Schools Project as it really brought to life the heritage of the Great War. Children practiced enthusiastically for several weeks learning the songs, discussing the meaning of the lyrics and the importance of singing to raise people’s spirits during difficult times. 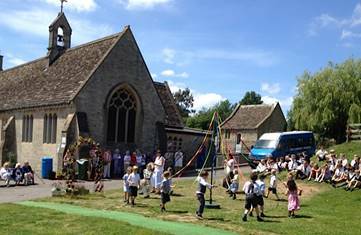 On the day the children came to school dressed as children from 100 years ago. They spent the morning baking scones and cakes and making elderflower cordial (from local elderflowers they had collected) to serve to the visitors. 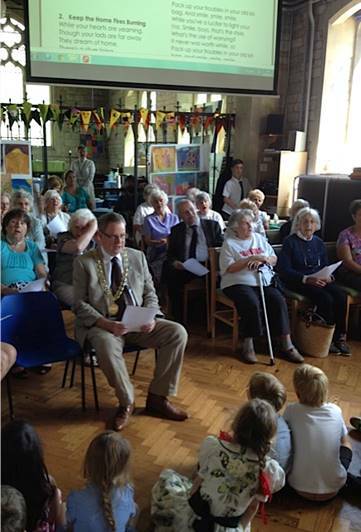 The children and the Goldies sang together creating a strong intergenerational atmosphere. We were fortunate to have a violin accompanist which added authenticity. The event was also attended by a number of elderly village residents. 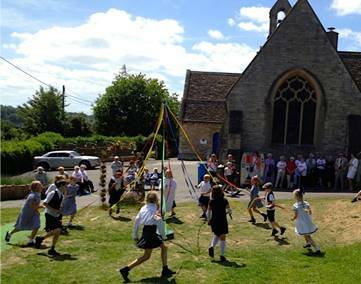 The children also performed traditional Maypole dances to the visitors. The afternoon ended with some of the older pupils serving tea and chatting with the Goldies in our school chancel.